Plus! Learn to play Nirvana, Coldplay, Bob Dylan, Derek & Dominos and more! 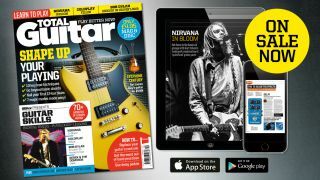 Total Guitar 289 is on sale in print and digitally from today. Subscribe to Total Guitar and get a free Tone City Golden Plexi overdrive pedal worth £39.99! Get the new year started with our guide to getting your playing sorted. From essential lead techniques to new chord shapes and progressions, songwriting tips and modes, we've got you covered for making quick progress. TG features more copyright tab and backing tracks than any other magazine. With our expert, easy-to-follow transcriptions, studio-quality backing tracks and advice on getting the sound, you can be sure that what you're learning is accurate, with a complete playing experience. Every month, we bring you trusted reviews of the latest affordable 'real world' gear on the market.